Give the gift of fresh, healthy local and delicious food from your neighborhood Greenmarket by purchasing Greenmarket Bucks for your clients, customers or employees! Greenmarket Bucks are $2 coupons that can be used to purchase any product in all Greenmarkets. Greenmarket Bucks are intended to introduce new customers to Greenmarket by introducing them to the fresh foods available at farmers markets as well as increase revenue for producers. 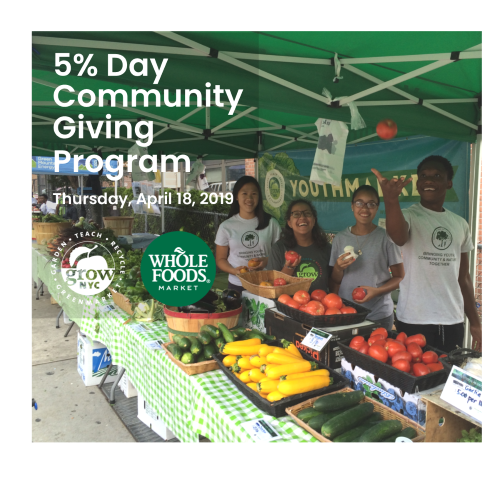 Greenmarket Bucks can be purchased by businesses, community based organizations and non-profit organizations as incentives or rewards to clients, employees or specific community groups. There is an administrative fee for the purchase of Greenmarket Bucks. Greenmarket Bucks are not available to individuals for purchase as gift certificates. GrowNYC is also seeking sponsors for Greenmarket Bucks to be distributed to students who attend school tours as well as seniors who participate in Greenmarket Seniors at the market or at their senior center. Greenmarket Bucks encourage and empower these individuals to purchase healthy, fresh food at the farmers market. Sponsors are provided the opportunity to place their logo on each Buck. Sponsorships and donations are accepted at any amount. For more information about Greenmarket Bucks contact Greenmarket.